This year marks the 10th anniversary of Free RPG Day, and somehow it’s the first time I took part in the event. I guess the main reason is that, where I live, there’s not a lot of publicity for the event. Okay, that’s an understatement. You’d have to specifically ask someone who knows about it, because I never did see any signs put up in a game store or notices posted online. Anyway, my friend Jeff told me about this year’s event at Mid-South Hobbies and Games, so I eagerly attended. The event at this store was run by a local gaming group called FORGE, and they recruited GMs for two time slots that day. Each 4-hour slot offered several games, and I picked Mutant Crawl Classics and Night’s Black Agents. 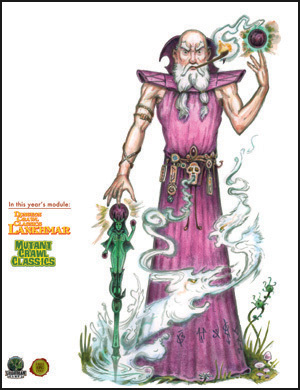 Jeff’s son Parker ran The Museum at the End of Time, a Mutant Crawl Classics adventure by Jim Wampler. I’m excited about this game—it’s the forthcoming far-future post-apocalypse game from Goodman Games, a companion game to Dungeon Crawl Classics. In this preview adventure, we played 0-level tribespeople who discover the titular museum and encounter its guardians, artifacts, and mysteries. I love any opportunity to use lots of dice. Except Shadowrun. My favorite thing was our weird character types. Besides pure humans, we had mutants, manimals (including one buffalo-man and a frog lady), and plantients. Judging from the layout of our character sheets, I suspect that characters in this game will be able to acquire more mutations after character creation. I hope so. Mutations are fun. 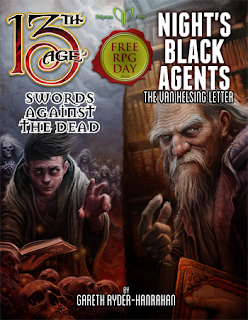 For our other session, Jeff ran The Van Helsing Letter, a Night’s Black Agents adventure by Gareth Ryder-Hanrahan. This was my first exposure to the Gumshoe system in play. (I’d read Trail of Cthulhu, but hadn’t played or run a game using the system.) 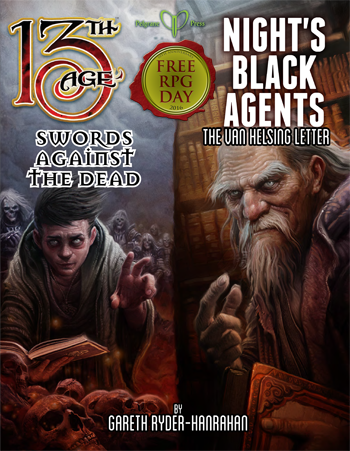 The players took the roles of modern-day espionage agents trying to track down something valuable left behind by Van Helsing—something that might help in a struggle against a strange kind of vampire. I was the driver. Definitely good driver. You know, sometimes you get a great group of players who really work well as a team, make smart decisions, and get the mission done without a lot of arguing, missing clues, and wasting time on unimportant activities. In addition to the gaming, I won raffles for a Free RPG Day 6-sider and a set of cool green dice! I’m proud of the 6-sider, because the first time I rolled it, it gave me enough damage to kill a sentry robot. Sweet! 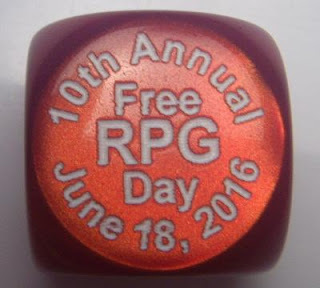 Did you attend a Free RPG Day event? Have you even heard of it before? Lemme know in the comments. Subsector Precinct Station 18: "The Donut"